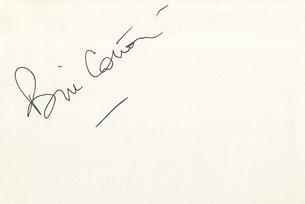 This is an In Person signed white card 6" x 4" by the late Television Producer and Executive. Sir William Frederick "Bill" Cotton, CBE (23 April 1928 - 11 August 2008) was a British television producer and executive, and the son of big-band leader Billy Cotton. Following a secondary education at the independent school Ardingly College, he joined BBC Television as an in-house producer of light entertainment programmes in 1956, working on various programmes such as his father's Billy Cotton Band Show and popular music programme Six-Five Special. In 1970, Cotton was promoted to Head of Light Entertainment, following the death of Tom Sloan in May. In this position, Cotton was responsible for overseeing the production of a whole series of popular and iconic comedy programmes, including The Morecambe and Wise Show (1968), Monty Python's Flying Circus (1969), The Two Ronnies (1971) and Bruce Forsyth's Generation Game (1971). Cotton's era was generally seen as the most popular in the history of BBC Light Entertainment, with programmes such as Morecambe and Wise becoming icons of British popular culture and drawing huge audiences, while the more subversive Monty Python provided a more cutting-edge, contemporary and daring complement. Cotton's success as Head of Light Entertainment led to his promotion to Controller of BBC One, the Corporation's premier and the UK's oldest television station, in 1977. He oversaw some of the channel's highest-ever audience figures in 1979, although this was mostly due to the main opposition, ITV, being on strike for over a hundred days. Due to a period of ill health, his deputy controller Martin J. O'Connor stood in as controller of BBC One from the autumn of 1979 to the spring of 1980.